‘Vine on the Dunes’ by Tom Gill on Flickr. Some rights reserved. ‘I am the vine,’ says Jesus (verse 1). The moment you allude to vines and therefore grapes – and hence to their product, wine – you get into difficulty in Christian relationships. In one Anglican-Methodist church I knew, the bishop was so intent on the communion wine being alcoholic and the Methodists equally determined to use non-alcoholic wine that a way forward had to be found. The bishop wouldn’t tolerate the Methodist suggestion that both forms of wine were made available at the sacrament. He therefore insisted that the wine be made by local worshippers trampling the grapes before the service, so that the Methodists could believe they were drinking grape juice and the Anglicans could believe that the fermenting process had begun. The one time I attended a communion service there under this regime, the lighting was poor and I felt like I was drinking something mushy – it was more like a thick New Covent Garden soup than wine. But we need not worry ourselves with such farces this morning. When Jesus says ‘I am the vine’, he is making an important statement to people who can hear the Jewish background. 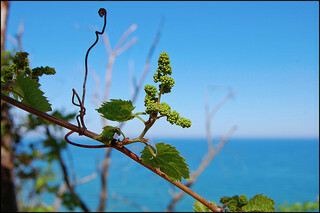 In the Old Testament, Israel – God’s people – was described as a vineyard. Isaiah 5 is a notable example. So for Jesus to call himself the vine is for him to claim that he is all that God intended the People of God to be. If we are to be joined to him as branches of the vine, then he is teaching us how to be and to grow as part of the People of God. Jesus is telling us here, then, about how we grow as God’s people. And hence why we read this passage at a Covenant Service. First of all, Jesus makes it clear that all we do in the process comes under the rubric of responding – that is, responding to God. The passage is filled with assumptions that God acts first, and we respond. Jesus is already the vine, the Father is already the gardener, the Father already loves Jesus, and Jesus already loves us. God’s saving actions come first. Everything we do is because God has already reached out to us in love through his Son. This is the very nature of a covenant. Ancient Israel’s covenant with God at Mount Horeb was similar to the covenants of their time. A powerful king rescued a weaker party. In gratitude, the weaker parties then responded to the wishes of the powerful one who had saved them. That is what we see with Israel when God has delivered her from Egypt. The covenant is set in place at the mountain of God, and the Ten Commandments are given. Thus Israel was never to keep the Ten Commandments and the other laws of God as a way to earn salvation, because their salvation had already been freely and graciously given in love: God had saved them from the evil power of Egypt. All that Israel did was a response. That is what we are coming to do today, as well. We are not coming in order to make impossible promises to God, fingers crossed behind our backs, hoping that we might manage to twist his arm into pleasing us. No: we are responding to God’s love for us in delivering us. We come to this Covenant Service, because God has already come to us in Immanuel, God with us, his Son Jesus Christ. We come to make our vows today, because God has already set us free in the death and resurrection of Jesus, and he is continuing to set us free from the penalty, the power and the presence of sin. Today we come, then, not to a severe God who wants to torture us with unreasonable demands, but to the God of outrageous grace. Let us come and make our promises today, because we are already loved by God. We do not have to win him over. It is rather God who wants to win us over to him. Do not let past or recent failure put you off. His arms are open wide from the Cross. He has stopped at nothing to love us. Our promises today are where we recognise that with joy, and say that we will stop at nothing to love God and love our neighbours in response. The second theme to pick out here is of remaining – as the branches of Jesus the Vine we are to remain in him in order to be fruitful. We need to be attached to receive the sap that enables us to make a difference in the world as Christians. ‘Remaining’ suggests something continuous, not a one-off event or action. Other translations speak of ‘abiding’, which implies permanent residence. Why is it important to emphasise ‘remaining’ in this way? Because there is a strand of Christianity which tends to reduce faith down to the moment of decision for Christ, and little else. Do not mistake me, deciding to trust Christ is important, but my point is this: the Christian life is not simply about a decision in the past, it is about on-going discipleship. Jesus called for disciples, not decisions. And disciples are those who are committed to the long haul. By definition, a disciple is a learner, or an apprentice. We do not learn our trade as Christians overnight. The training and the study take a lifetime – maybe more! So Jesus therefore calls us to ‘remain’ in him. That way, he can nurture us. Remaining in him involves staying closely connected to him, through all the classic ways: prayer, Bible reading, worship, the sacraments, fellowship, solitude, silence, simplicity, fasting and so on. One renewed commitment we might make today is to our spiritual disciplines, or ‘means of grace’, as John Wesley called them. I believe that when we say things like that, there is good news for us: God’s grip on us is stronger than ours on his. Let me illustrate the point like this. I was once asked to complete a questionnaire to discover what kind of a learner I am. There were four different learning styles that you could be. Most people were not exclusively one type, but a varying mixture of the four. In my case, I was predominantly someone who learned knowledge by studying the theories behind it. I was also someone who learned by reflecting on things that had happened. I learned a little bit by putting things into action, and I learned little or nothing at all from a pragmatic approach. If you know me well, none of that will surprise you – academic, theoretical and impractical. But for someone like me, Jesus says the way to learn discipleship in the People of God is not by theory. Or at least doing the theory is not enough on its own. It has to be put into practice. I have commended the spiritual disciplines yet again this morning, but just doing them is not enough on its own. What we learn from our devotions has to be put into practice in the form of obedience to Christ. Two weeks ago I mentioned in passing when I talked then about practising spiritual disciplines that one of the church members I had known in the past who had been most faithful in daily Bible study had also been one of the cruellest Christians I had come across. She was someone who did the theory but didn’t translate it into action. Indeed, unless we act on what we learn we will earn that common charge made against Christians, namely that we are hypocrites. Ultimately, the need to obey is about love. Jesus links keeping his commands with remaining in his love. Does that sound tough or unfair? Well, granted we often think of love in terms of equal relationships, and so obedience is not the first category that comes into our minds, and we would have to acknowledge that our relationship with Christ is not one of equals. Nevertheless, love is possible, just as we call a child to do what a parent asks in the context of a loving family. If we love someone, we have more than warm feelings for them: we want to do what pleases them. When we do so, that strengthens the relationship we have with them. And that, I think, ties together everything this is about today. For, as I said first of all, we are responding to a God who in Christ has reached out to us in love in the first place. All that we do is in loving response to his love. And in the light of that love, we secondly want to remain in the relationship: we are in this for the long haul in a disciplined way, even if there are also times when we are able to do no more than cling on. And so thirdly we want to demonstrate that remaining in Christ’s love by obeying. These things bind us more closely to Jesus the Vine, the True Israel. We become more truly what we have been called to be by grace: the People of God. Posted on September 6, 2013, in Sermons and tagged Covenant Service, discipleship, People of God. Bookmark the permalink. Leave a comment.